By Michael Stebbins. Michael Stebbins is the Director of External Engagement for the Council for Biotechnology Information. Raised on an apple and grape farm just outside Buffalo, NY, he has been in Washington, D.C. for more than 20 years working on a variety of issues in the medical, science, and technology fields. From the beginning, GMO Answers has always encouraged consumers to participate in conversations about GMOs when it comes to making decisions about the food they eat. Each October, GMO Answers celebrates “Get to Know GMOs Month,” sparking the conversation in a new way by diving into the most common questions and misconceptions about GMOs. This year’s Get to Know GMOs Month is dedicated to finding new ways to engage consumers about GMOs and biotechnology, specifically related to innovation in the field. From concerns about the safety of GMOs, their impact on the environment and how GMOs are made, understanding the basics and science behind genetically modified crops is vital to ensuring a sustainable future for all. GMOs are safe for people and animals to eat, as the National Academy of Sciences (NAS) confirmed in a 2016 report. They provide many benefits to the environment, including reduced carbon emissions, improved soil health and water conservation. And contrary to what many may think, GMOs are not new. GMOs are created through a modern plant breeding process, where a desired trait, like disease resistance, is taken from one plant or organism and transferred to another. This technology has been around for decades and farmers have selectively cultivated plants for thousands of years. Even more, GMOs and biotechnology play a crucial role to help sustain our planet’s future. 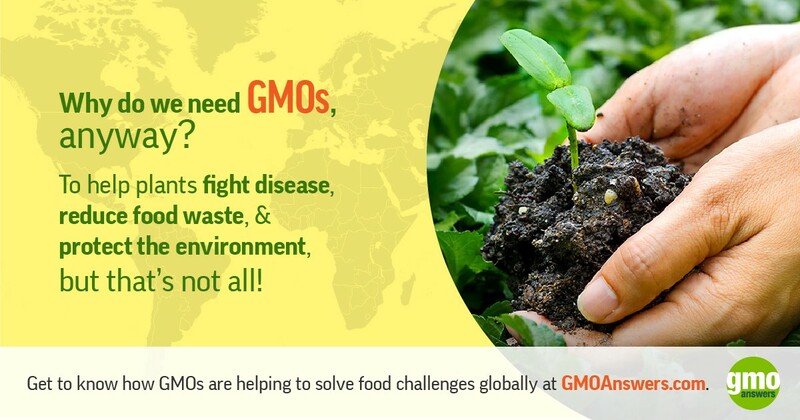 GMOs are one of modern agriculture’s many innovations that allow farmers to grow more food with fewer resources. Last year GMO Answers conducted a nationwide survey to gather consumers’ top ten questions about GMOs, then hit the streets of Washington, DC, to engage people about GMOs. We found that most people were aware of the benefits GMOs provide the environment and food system, but there is a lot more to learn. This year, to drive online engagement, GMO Answers launched a Facebook quiz that tests your knowledge about GMOs, as well as our GMO Innovation Contest — an online video contest designed to encourage anyone to “Get to Know GMOs” by identifying food and environmental challenges that could be solved using biotechnology. More information about the Innovation Contest can be found at InnovationContest.GMOAnswers.com. GMO Answers’ mission has always been to engage with the public in these crucial conversations, and we’ll continue to answer any questions about how our food is grown. This October is the time to learn the facts and Get to Know GMOs!